Campaigners who saved memorial trees planted in memory of First World War soldiers from the chop have thanked their supporters, including The Star, for their help. Action group Western Road Remembers was set up in November 2016 after Sheffield Council announced plans to cut down trees honouring those who paid the ultimate sacrifice. Alan Story, of Western Road Remembers. But the council and contractor Amey announced 20 of the 23 trees in the Crookes street earmerked for the chop would be saved. The group held protests outside Sheffield Town Hall and decorated thre trees with ribbons and the campaign also attracted strong media interest – including a Star front page, highlighting the issue. Member Roy Millington, 83, also spent ten hours a week outside the town hall and the group handed out more than 6,000 flyers. Roy Parkin protested outside Sheffield Town Hall about the plans to the fell Western Road memorial trees. Alan Story, of the group, said: “The support has been great across the city. This was a political issue and utlimately, the political pressure of Roy and other members standing in front oof the town hall, where the decision makers arrive every day has paid off. “We had 200 people turn up to a photoshoot outside my house. It was a political victory and when I say gthat I don't mean party political because we're not associated with any party, but it was political pressure that won the day. READ MORE: When is Black Friday, what is it and what are the opening times at Meadowhall? Councillors voted in December 2017 to remove the trees after estimating it would cost £500,000 to save them. However, the council said an agreement had been reached with contractor Amey to retain the majority of the trees. The Western Road trees are a designated war memorial and were planted in 1919 in memory of pupils at a nearby school who died fighting in the Great War. Other trees are on Tay Street, Oxford Street, Binfield Road, Springvale Road and Heathfield Road. Speaking when he made the announcement last week, Coun Lewis Dagnall, cabinet member for Environment and Streetscene, said: "In this, the week of Remembrance Day, I am confirming that we have developed a plan to retain 32 of the 35 war memorial trees that were originally earmarked for replacement. "Amey have agreed to fund the costs of delivering this new agreement, and there will be no additional cost to public money." 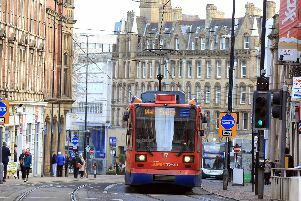 Amey is carrying out the works as part of its £2.2 billion contract with Sheffield Council. The trees have been assessed as either dangerous, dead, diseased, dying, damaging or discriminatory. But campaigners claim many of the trees classed as damaging or discriminatory are healthy specimens which should not be cut down. The dispute led to a number of protests resulting in the authority announcing a pause in the programme earlier this year.